NEUSPEED Brakes - Big Brake Kit VOLKSWAGEN - Dezod Motorsports Inc - Home of the automotive performance enthusiast since 2002. 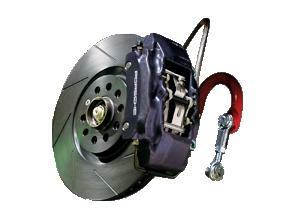 If you want big front brakes but don’t have a big budget, NEUSPEED’s economy upgrade kit is just for you. The NEUSPEED kit provides everything you need to convert your car to 12.3”(312mm) Audi TT Quattro front rotors and Porsche Boxster 4-piston calipers. We supply the brake rotors, the NEUSPEED billet aluminum caliper adapters, and custom stainless braided lines. All you have to do is buy the Porsche Boxster calipers from your local Porsche dealer or dismantler, and brake pads from us or any other Porsche parts supplier. Brake pads and calipers sold separately. You must have 17”or larger diameter wheels and wheel spacers to use this kit.